This beautiful Sharp Shinned Hawk has flown into my dinning room window twice now. 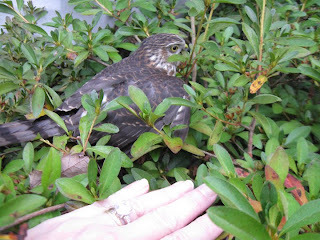 The first time, I ran out and picked him up out of the bushes before the cats could get to him. 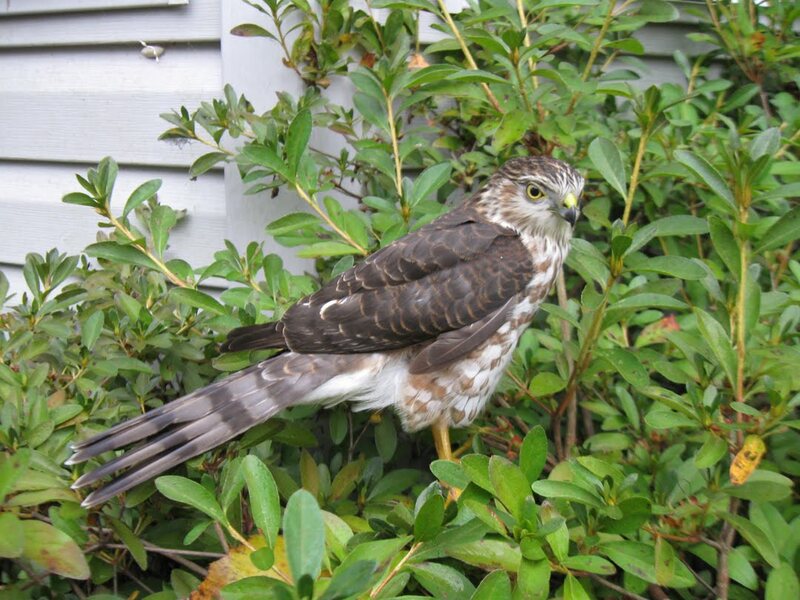 I then remembered my husband telling me how much damage this type hawk can inflict on a human. The beak alone would disable me, imagine what the talons would do. 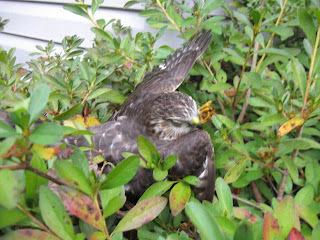 So before he regained consciousness, I placed him on top of my flower pot tower and watched as he revived and flew off. About half an hour. Guess what? I was so excited, I forgot to get pictures. So yesterday, Daffy was at it again. 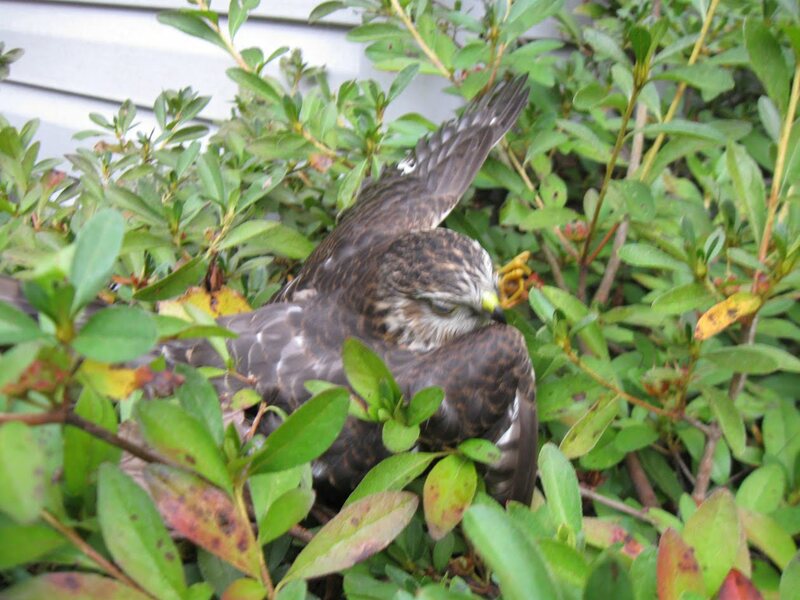 Flew into the window and landed as you see here in the bush below. This time, I grabbed the camera and turned him over onto his feet, soothingly whispered to him and kept guard until he could fly off again. He did not seem to mind my touching him a bit, but all the same I was careful to not excite him. In the photo of my hand, remember that whatever is closer to the camera is going to look larger. My hand is actually about half as large as the bird and it took two hands to totally surround and hold him. I think he is probably a bit larger than the crows we have around here and much larger than a blue jay. We now leave the dinning room light on when it is overcast or dawn. At those times of day, the trees across the road reflect into the window of the dark dinning roon and appears like sky that the birds can fly into. The miniatures show has officially ended as of yesterday. I will spend the next week, boxing and shipping artwork back to artists and to our clients who purchased artworks. I am pleased to report that even in this bad economy the sales at our gallery were still strong. We hung 149 paintings this year. Last year we hung 183. This year we sold 22 paintings as opposed to 28 last year. I have the Rappahannock Artists' Studio Tour coming up on November 6 & 7 and must have all the miniatures out of the gallery and a new show hung for this show weekend. Its a huge amount of work and a very long weekend with long hours. Because of the limited space at the gallery, I can't store artwork there and must transport my work from home for each new show. I am always dreaming of a larger gallery/studio. How about you? This morning at around 4:30, my first grandchild was born. A little girl who weighed in at 8lbs. 15 oz. No name as of yet. Both mother and daugther are doing fine, the dad survived also. We are on top of the world today. My new slogan is "Focus or Fail". I find that when I am distracted by life going on outside of the studio, ie family, e-mails, or non art errands, my work fails to be worthwhile. I just spent the weekend, totally immersed in my miniatures work at the gallery. I do not and will not have a computer there and I was surrounded by beautiful miniatures, talking to clients about miniatures, selling miniatures (9 this weekend) and working on a miniature. It turned out beautiful and I am so pleased with it. I was focused and it showed in my work. On page 16 of the October issue of Northern Virginia Magazine is an article about the miniatures show at Ice House Gallery, complete with a tiny image of my fawn miniature. I still have not been able to locate the article that Virginia Living Magazine had called and interviewed me for. I also gave them an image. Guess I got bumped on that one. The Piedmont Virginian Magazine also did a very nice piece about the show with an image. All three magazines a found on line, but I have not checked to see if the stories are in the online versions. This morning I stumbled to the kitchen for eye opening coffee as usual. Filled the carafe, poured water into the maker, added a filter and then coffee for six cups. I went about the business of fixing breakfast and a lunch for my husband while my own personal drug of choice brewed. Finally, I poured a cup and took a sip. HMMMMMMM Something tasted off. Oh well, I have fall alergies and this morning my nose was runny and stuffy. So I set the coffee aside and rushed to get the lunch and breakfast. I did not return to the cup of coffee until I was sitting down to eat with my husband. I took another big mouthful and immediately smelled stink bugs. I told my husband about the odd way my coffee smelled and he suggested I check out the coffeemaker. He laughed and said they can get into anything and anyplace. You can imagine my horror and disgust when I lifted out the basket of grounds to find a bug, belly up in the basket holder. Before you go judging me on my cleanliness I will just say this.....I have been accused of being OCD with regards to housekeeping and my husband often calls me Brie (The Red Head Desperate Housewife on TV), when I am scolding him for sloppiness. I always clean the coffee pot and basket after each morning use and have everything ready for the next morning when I am like a zombie waking up. I will now add checking out the entire coffee pot under a strong light before I make coffee from now on. F. Lennox Campello, Artist, Writer and Critic has a blogspot that may be of interest to you. Go to http://dcartnews.blogspot.com for all sorts of news and commentary. Mr. Campello is often a juror at The Art League and also writes for the Old Town Crier. His Gallery Beat article this month is about "The Prickly Issue of Labels" and refers to the lumping of artists into catagories in order to define or judge their works. Of special note is the new appointment of E. Carmen Ramos as the first curator for Latino art at the Smithsonian American Art Museum. Rather than review his article, I will direct you to the October issue, page 14 and just say this about his commentary. "Mr. Campello is right on target with his thinking. Why must we judge and catagorize artists this way? I am a female, but I don't wish my gender to be a factor when viewing my artworks. Just hold my painting next to another artist's works and judge it on its merit, not my gender or ethnic ancestry. I am descended from Irish immigrants, but that should have no bearing on whether or not my art is valid or better than another persons works." I suppose I am politically incorrect in my thinking, but I can't understand why the Smithsonian would even need a Latino curator, just put all the paintings into a room and forget about these ridiculous labels. I have always enjoyed Inspirational Slogans, Sayings and Words of Wisdom. So much so, I post one in the home studio above my Goals Board where I see it daily. Since 2001, when I quit my secure job at the US Postal Service, my inspirational slogan has been "Fortune Favors the Brave". That actually came out of a fortune cookie the week I finally decided to pack it in with the Post Office. I will try to post a new slogan occasionally for my readers......sometimes we all need a little slogan when we are feeling lost or down. The greatest thing about having a small gallery and studio open to the public is, I get to meet so many wonderful artists and lovers of art. This weekend I met Susan, the owner of The Apple Tree. Her shop is located at 5240 Port Royal Rd. in Springfield Virginia. Go to www.theappletreeinc.net to see her website and all that she offers at the shop. You can always spot the real art lovers, they linger over every piece on the walls. Susan refered her friends the Grimsteads who came out the next day with their daughters and I finally found out the artist who sings Hey Soul Sister, from their beautiful daughter. Thank you, now I can add that to my ipod. Later in the day, Chuck Hunter, came by and was amazed at the miniatures. Chuck lives in town and stops in occasionally. I am very impressed with his knowledge of art and antiques and enjoy our conversations about art. I hope that if you come to Virginia, you will make time to visit with me in Little Washington. I have noted a few problems with the Ice House Gallery website and have asked the web guru to try and clear them up. Please have patience! Also, it was suggested that we place every painting in the exhibit on the site and not just the winning entries. Oh how I wish I could. Unfortunately, we have 153 paintings on display and it took the webmaster two hours just to put on nine pictures. As we all know, webmasters are paid by the hour and my webmaster is no exception. We are still too small an enterprise to be able to do this. The 2nd Annual Little Washington Miniatures Painting Exhibition opens today and we have153 tiny little masterpieces hung in the gallery. The show is absolutely beautiful.